Legal transcriptionists listen to dictated recordings made by attorneys, paralegals, and other legal professionals and then transcribe them into legal documents. 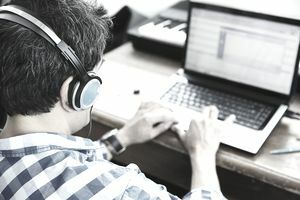 They generally listen to recordings on a headset, using a foot pedal to pause the recording when necessary, and key the text into a computer. The documents they produce can include correspondence, pleadings, motions, discovery, legal memorandums, agreements, and time entries. Documents that have been transcribed can end up being produced in court. Transcriptionists use a computer keyboard to transcribe dictated recordings. This differs from a court reporter, who uses stenography equipment to transcribe the spoken word. A court reporter is charged with capturing "live" conversation—dialogue as it occurs in a courtroom or a deposition where testimony is taken prior to court proceedings. A transcriptionist types dictation. The attorney records what she wants to say in correspondence, memos, or the content of legal documents. The pace is typically slower and more deliberate than the testimony of a witness in court. Legal transcriptionists must continually edit the information they transcribe for clarity. They must ensure that the transcribed copy is free of spelling, punctuation, grammar, and typographical errors. Legal transcriptionists might also perform administrative duties such as organizing and filing legal documents and tracking deadlines. Comprehensive knowledge of the legal system can be very helpful as well, particularly for those who have an eye on advancing to a paralegal position. A high school diploma and experience in an office or legal setting are often the only requirements necessary for an entry-level position. Legal transcriptionists often receive on-the-job training from an attorney, paralegal, or office manager. Many community colleges, vocational schools, and technical schools offer legal transcription training programs to help expand your employment options, however. You can complete some programs in as little as five months or earn a certificate in legal transcription in as little as one year's full-time study. You can earn an associate degree in legal transcription technology in two years. Legal transcriptionist career diploma programs are also sometimes available online, such as with CourtReporterEDU or TranscribeAnywhere, if squeezing in classroom time is difficult for you. They teach legal concepts and the basics of the U.S. legal system, as well as the art of legal research, common legal terms, and jurisdictional laws. But many go beyond that. They'll also train you in areas such as time management and communications skills. If you opt for a classroom setting, you'll most likely also gain the benefit of "real life" practice exercises. Some other core courses found in a legal transcriptionist training program include word processing and typing, court reporting theory, English and editing for transcription, computer-aided transcription, legal dictionary building, and basic dictionary building. It's possible to become nationally certified through the American Association of Electronic Reporters and Transcribers. Many transcriptionists are independent contractors who work from home and offer their services to attorneys and legal employers. Other legal transcriptionists work as legal secretaries, legal assistants, or clerks in law offices, corporations, banks, insurance companies, public interest venues, or the government. Legal transcriptionists who work at home are more likely to work irregular hours, including part-time, evenings, and weekends. But they have the flexibility of scheduling their own hours to fit their lifestyles so that they can work around family demands. If the job involves secretarial or administrative duties, however, this would typically necessitate that the transcriptionist have access to a client's file. Most reputable attorneys will not allow files to leave their office premises because of issues of attorney-client confidentiality. Legal transcriptionists often sit in the same position for long periods. They can suffer wrist, back, neck, or eye problems caused by strain, and they risk repetitive motion injuries such as carpal tunnel syndrome. They are sometimes required to work at a prescribed productivity pace—for example, they're expected to transcribe 1,015 lines or more per day or 145 lines per hour while maintaining 98 percent accuracy. This fast-paced environment and the constant pressure to be accurate and productive can be stressful. The Bureau of Labor Statistics (BLS) does not track salary information specifically for legal transcriptionists, but those in similar jobs earn between $20,000 and $60,000 per year with an average of about $26,400 as of 2018. Those who work as legal secretaries or legal assistants at large law firms tend to earn incomes at the higher end of that salary range. Law firms in larger metropolitan areas tend to pay more than those in more rural or suburban areas. The average in Philadelphia is about $40,000 as of 2018 while transcriptionists in Johnstown, Pennsylvania earn about $10.35 an hour—about $21,500 a year.